One of the ways that pressure on home-buyers can drop over time is that inflation erodes the purchasing power of mortgage payments. However, this pressure valve is less effective with today’s low inflation. Imagine a young couple taking on a 25-year $250,000 mortgage. Today, they might pay a mortgage rate of 3.5% and expect 2% inflation. Imagine a 2% increase in both (5.5% mortgage rate and 4% inflation). How does that change the financial pressure on our couple? In the first scenario, the mortgage payment is $1244/month, and in the second scenario the payment is $1515/month. But this only tells part of the story. The following chart shows how these payments change over time when we adjust for inflation. In the first scenario, the purchasing power of the mortgage payments drops by 39% over 25 years. In the second scenario, the purchasing power of the mortgage payments drops by 62% over 25 years. While the first couple starts with lower payments, the pressure of these payments drops less over time. The next factor to consider is that housing prices are way up mainly because mortgage rates are so low. Imagine that in the first scenario, the mortgage size increases so that the payments start at $1515 (the same level as the second scenario). Now the blue line in the chart above rises up to start at the same level as the red line, and the couple in the first scenario starts with the same financial pressure as the second scenario. The really bad news is that the couple in the first scenario will have most of this pressure sustained against them for the full 25 years. The couple in the second scenario will get far more relief over time. 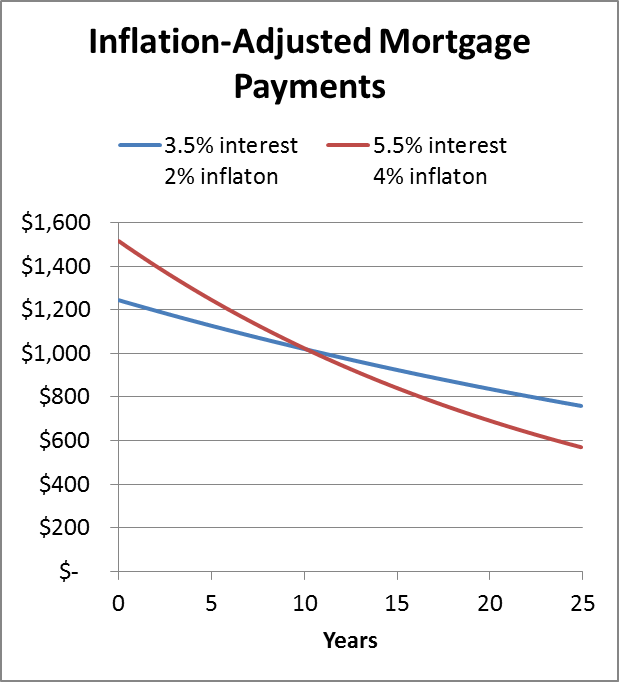 Back in the very high inflation times of over 30 years ago, homebuyers just had to make it through the early years of their mortgage and inflation would help to make the payments more affordable. Today, this margin of safety is mostly gone. However, inflation isn't a constant so I expect that eventually it will go up. On the other hand, so will interest rates..
@Mélanie S: Governments seem to be doing what they can to keep inflation low, so debtors shouldn't count on higher inflation to take pressure off. That's one of the reasons we opted for a 30 year mortgage. Leverage up for as long as possible at reasonable interest rates. Although would the "pressure" only get released over time assuming that their income keeps up with inflation as well. @Passive: Inflation is closely tied to average wages, but you're right that there is no guarantee that yours or my wages will keep pace.